What is a Tarsal Coalition ? Foot skeleton showing the tarsal bones. 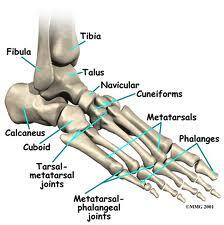 The term ‘tarsal’ refers to the seven bones in the back half of the foot. ‘Coalition’ means two becoming one. A tarsal coalition is an abnormal bridge of material that connects two of these foot bones that should be entirely separate from each other with a normal joint in between. Children’s bones are very soft when they are born. The bones can still flex enough to allow painless walking until the child’s skeleton has ‘matured’ with age. Skeletal maturing means that bone is laid down in the cartilage of the immature bone shape gradually until adult bone is achieved at about the age of 17 (in the feet). The onset of symptoms usually occurs at about 9 to 14 years of age. Anatomically, the abnormal ‘bridge’ of tissue is just about all cartilage in the young child, often virtually all bone in an adult and a mix as the skeleton matures in between. Some fibrous tissue (like gristle) is often also present. When the link becomes bony enough, it results in limitation of motion and this brings about the onset of pain. The tarsal bones are the rear most bones in the adjacent diagram: calcaneus, talus, navicular, cuboid, and three cuneiform bones (medial, intermediate and lateral). These bones create the joints that allow complex motions to occur in the feet, such as walking over uneven terrain and creating a pattern of walking that allows normal function of the knees, hips, back, etc..
What causes a tarsal coalition ? Tarsal coalition is almost always a product of a problem during the dividing of embryonic cells during the development of the foetus. Other, much rarer, causes could include a surgical ‘screwing together’ of two bones, a very advanced case of arthritis in an adult leading to joint fusing together over time or some other very traumatic event. The birth defect of tarsal coalition is thought to be an autosomal dominant genetic condition. This means that if you have a parent with the disorder it is highly likely to be passed on to offspring. What are the symptoms of a tarsal coalition ? Although you are born with a tarsal coalition, as mentioned above, symptoms do not occur until the bone has become more solid on the way to adulthood. Often, the symptoms ‘turn on’ suddenly one day and then just don’t go away. These can include pain which can be quite severe and debilitating, fatigue, muscle spasms and cramps, inability to rotate the foot & ankle and needing to walk with the foot in a contorted position to continue to get around. How is a tarsal coalition diagnosed ? When consulted by an adolescent with rear foot pain, the podiatrist will examine the area. The physical exam will usually reveal that the normal foot movements are limited in some way. This is both because there is a physical blockade to movement and because the brain will ‘turn on’ the muscles around the area to stop the joint moving toward the painful zone. X-rays will usually be ordered and – if there is enough bone in the tissue bridge that pain has begun – there will usually be enough bone laid down to show up in an x-ray. More high-tech investigations such as CT scan will be required if proceeding to surgery. If the bridge appears to be comprised mostly of fibrous tissue, an MRI would be the preferred modality to use. The two most common types are the calcaneonavicular coalition where there is a failure of separation between the calcaneus and the navicular bones and the talocalcaneal coalition between the calcaneus and the talus bones. These might also be known as a calcaneonavicular bar or talocalcaneal bar. The term “bar” refers to the abnormal “bar of bone” or fibrous tissue bridge between the two bones. There are other bone coalition combinations possible but they are quite rare. In both cases, despite the bar being in different locations, the pain occurs in the same rough location – on the outside of the foot just below and forward of the outside ankle bone. This area is called the sinus tarsi. If the problem is not treated and abnormal walking style develops, other joints between the foot and lower back will be annoyed. What are the non-surgical treatment options for tarsal coalition? The goal of non-surgical treatment of tarsal coalition is to relieve the symptoms by reducing the movement of the affected area. This might include non-steroidal anti-inflammatory drugs (NSAIDs), steroidal anti-inflammatory injection, stabilizing orthotics in the shoes or immobilization of the foot via a leg cast. Sometimes, short term immobilization followed by long term orthotic use may be sufficient to keep the area free of pain. Surgery is very commonly required. The type and complexity of the surgery will depend on the location of the coalition. Essentially, there is two types of surgery. Wherever possible , the bar will be removed to restore normal motion between the two bones. If this is not possible, it may be necessary to fuse the affected joints together by using screws to connect them solidly. Cutting away the coalition is more likely to succeed the younger the patient. With age, comes extra wear in the affected and adjacent joints that makes treatment more difficult.